ASI Waste is committed to helping your facility implement regulatory compliant solutions for your Rx Waste disposal needs. We have experts that can work with your facility to implement a simple and successful program for the management of pharmaceutical waste. This is a waste stream challenging many healthcare institutions over the past few years, and it can easily be overcomplicated. We are able to offer turn-key solutions that simply assuring the proper classification and disposal of pharmaceutical wastes. Hospitals and clinics generate a substantial amount of pharmaceutical waste that requires proper disposal. Typically, this waste is comprised of drugs that have been partially dispensed, but not completely used. Our Pharmaceutical Waste Compliance Program is a hospital-wide program that will minimize environmental impact and regulatory exposure from improper identification, segregation, collection, and disposal of pharmaceutical waste. 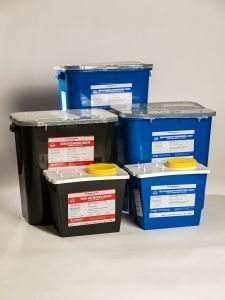 Because each facility is unique in this layout and mission, we take a strategic and customized approach when developing and implementing a pharmaceutical waste program. Our program includes a waste characterization of your entire pharmaceutical formulary, a system for labeling, training programs for the staff, set up of accumulation areas as well as on-going consultation services. We offer a comprehensive, turn-key service we provide the best possible management of your pharmaceutical waste. Contact one of our Pharmaceutical Waste Specialists about developing a new program to capture this waste stream or improving upon an existing program!